One of the most anticipated annual releases from Moon Dog is back. 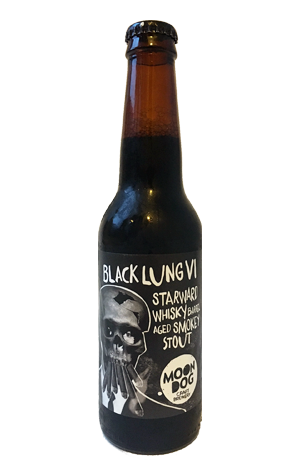 The Black Lung is a peated, barrel-aged imperial stout that has appeared in a different form each year for six years now. The difference comes from the choice of barrel in which the beer spends time before packaging: first up was a bourbon barrel to be followed by others including whisky, Pedro Ximenez and fresh oak. It's a beer that has picked up trophies in the past (and is the brewery's entry in the forthcoming Great Australian Beer Guide). In 2016, with a sixth cigar now shoved into the skeleton's gob, it's a second appearance for whisky, three years on from the release that was probably the fiercest to date. This time around, it's barrels from fellow Melbourne craft producer Starward and again the impact is distinct, although here it's a juiciness from the whisky that comes to the fore. It works as a counterpoint to the iodine like smokiness of the heavily peated malt and adds some back palate spice alongside the lingering dark chocolate flavours.